Osteoarthritis is the most common form of arthritis with over 75 percent of the over 55's showing some sign of this disease. Most people with O/A show no significant symptoms or pain! For others the pain and joint stiffness can be agony. It can affect one or many joints. Osteoarthritis is commonest in the small joints of the hands, the spine, the knees, the hips, and big toe joints. Osteoarthritis mainly affects the joint cartilage - the shiny smooth bit over the ends of the bones which acts like a shock absorber. 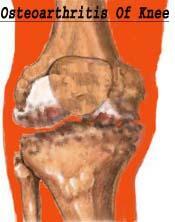 In osteoarthritis the cartilage becomes worn away, causing the bones to rub against each other roughly. Bony outgrowths or spurs can form at the sides of the joints and the joints become misshapen. The outer part of the joint, the capsule, becomes thicker and less mobile and the inner lining, the synovial membrane, becomes hot and swollen. Sometimes the other soft tissues, the ligaments and tendons, can also become damaged and swollen. Muscle shortening and stiffness can result from under use of the joint leading to more pain and stiffness. Although no-one yet knows the precise cause of O/A, there's a number of factors which may lead to it. 1) Damage to a joint, such as a broken bone, or an infection leading to the progression of the disease. 3) Overweight people. More likely to get hip and knee arthritis. 4) Age. The older you become the more likely you are to have this disease. 5) Other forms of arthritis. 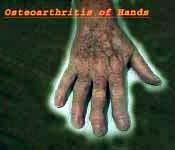 Such as Rheumatoid or Psoriatic arthritis which can damage the joints leading to the chain reaction of O/A. 6) Genetic. Sometimes your genes can play a part in the development in some forms of O/A. A key gene which appears to increase the risk of developing osteoarthritis has been found by scientists. The scientists, who focused on Japanese patients with knee or hip osteoarthritis, also found that the more severe the disease, the more likely the mutant form of asporin was to be present. To keep cartilage tissue healthy and functioning properly, the body must strike a delicate balance between breaking down cartilage that has come to the end of its useful life, and replacing it with fresh tissue. If the degradation of cartilage is outstripped by production of new tissue, then osteoarthritis can result as the unprotected ends of the bones rub together, causing inflammation. It is thought that asporin plays a role in regulating the production of new cartilage by impacting on growth factors which trigger its development. You will have one or more stiff painful joints which gradually become worse, particularly when used. The stiffness is worse in the morning or after sitting for a time but eases off as gradually used. The joints can crackle when used ( "crepitation"), and can become swollen, enlarged and tender. 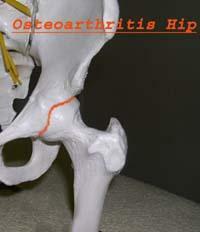 In the knees the joint can "lock" when bending and most people with O/A hips will have a distinctive gait or limp. Your Osteopath will take a careful case history and then examine you in great detail, noting your ranges and quality of movement. He will do minor tests for trapped nerves and in rare cases may request an MRI scan. X-rays can be helpful, as it is very important that your Osteopath rules out other types of arthritis, or if your O/A was caused by another type of problem. When a diagnosis has been reached, your Osteopath will discuss the treatment options with you. It is essential that you seek advice quickly because, apart from getting an accurate diagnosis, evidence shows that the sooner you consult your osteopath, the quicker you will be better! No-one can cure Osteoarthritis but your Osteopath may be able to help you with the pain and stiffness associated with the disease processes. Your Osteopath will encourage you to do gentle exercises, lose weight if necessary, may prescribe orthotics for your shoes, and advise dietary changes. There seems to be sufficient clinical evidence to suggest GLUCOSAMINE SULPHATE and CHONDROITIN for those who can take it. I have found LASER THERAPY to be very helpful in the treatment of certain arthritic conditions.